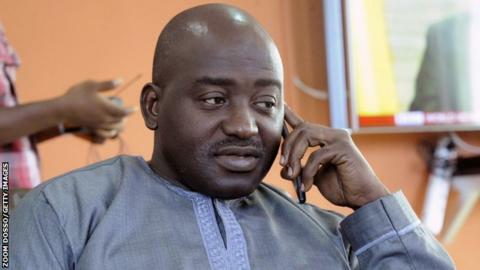 Liberia FA chairman Musa Bility is backing Prince Ali of Jordan in the Fifa presidential race. Half of Africa's federations look set to oppose the Confederation of African Football's (Caf's) instructions to support Sheikh Salman in this month's Fifa presidential elections, claims Liberia FA chairman Musa Bility. Caf pledged support to the Bahraini on Friday while overlooking the candidacy of Africa's only entrant, Tokyo Sexwale of South Africa. "I have been in contact with 26 African FA presidents and none will vote for Sheikh Salman," Bility told BBC Sport. The continent is seen as a key campaigning ground since Africa's 54 members represents the largest regional voting block of Fifa's 209 member associations. But Caf cannot vote as a whole - each member nation will vote individually in a secret ballot. "We are attempting to restore integrity and change Fifa for the good of the game," Bility said in a letter to African FA presidents. "It is for that purpose - to right the wrongs and to offer our organisation a real chance for the change we seek - that I have decided to endorse the candidacy of Prince Ali of Jordan. "Prince Ali's action is clear and based on principled leadership. I trust him and urge you to do the same," he added. Prince Ali was the sole challenger to Sepp Blatter in last year's elections but conceded defeat ahead of a second round of voting after losing the first round 133-73. Despite not having Caf's backing, Sexwale told various news outlets - including the BBC - that he still plans to stand in the Zurich election. "The elections of the Fifa candidate on the 26th of this month goes ahead, and I am a candidate." Sexwale told BBC Sport. "It goes ahead because I have been sent by my own association from South Africa and I am also representing the aspirations of many associations across the world who have nominated me to be a candidate, as well as many other people who are ready to vote when we reach Zurich" Sexwale added. Last month, Caf signed a Memorandum of Understanding with the Asian Football Confederation - over which Sheikh Salman presides - with Sheikh Salman earning criticism from Prince Ali. Prince Ali complained about the agreement and its timing to Fifa, who replied last week to say it saw nothing wrong with the deal.